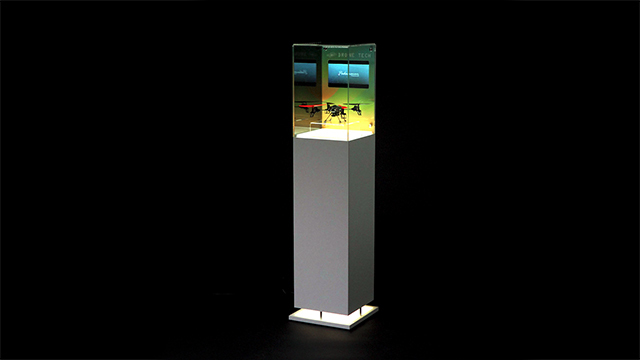 These digital display cases are sure to catch the eyes of passersby at your next big event. Ideal for museums, retail stores, tradeshows, and more, this vitrine is the perfect way to create a memorable experience. Available in both black and white with LED illuminating lights, the fixtures can blend well with any decor. Upload content and create custom graphics for the backing for a truely unforgettable product showcase. Kevin: " What's up guys, it's Kevin from Displays2go here to talk about our Digital Pedestal Display Case. Outfitted with a 10.1" HD screen. You can upload content using HDMI, USB, or an SD card port on the back. We have LED lights to illuminate your products from underneath. It's a content plug and play solution and we also have a protective acrylic topper to keep your products safe as well as a customizable imprint area around the screen. So come check out this Digital PEDLED display case online at Displays2go.com. Nobody does display cases like us!"